Blue Sushi Sake Grill - We serve fun sushi! Blue Sushi Sake Grill unites creative ingredients with energetic vibes, premium cold sake with happy moments to give you a fresh and fun new way to experience sushi. What better way to celebrate our opening than with seriously-discounted Sushi Lunch Specials? Hurry, this deal ends April 30. A happy life is built with many happy moments, and of course, Happy Hour! From martinis and maki, shared cool and warm plates, you'll find the true meaning of happiness right here at Blue Sushi Sake Grill. Join us for Happy Hour every day that ends in "y". We have a hunch you’ll love this crunch! Crunchy Thursday means all 4 Crunchy Rolls are just $6 each, all day long. Our sushi and grill menus allow you to explore your sushi favorites in new and unexpected ways. We like to say that sushi is for sharing, and our menu encourages it. Order a spread of all your maki, nigiri and sashimi favs from the sushi bar, and throw in a few orders of starters from the grill. 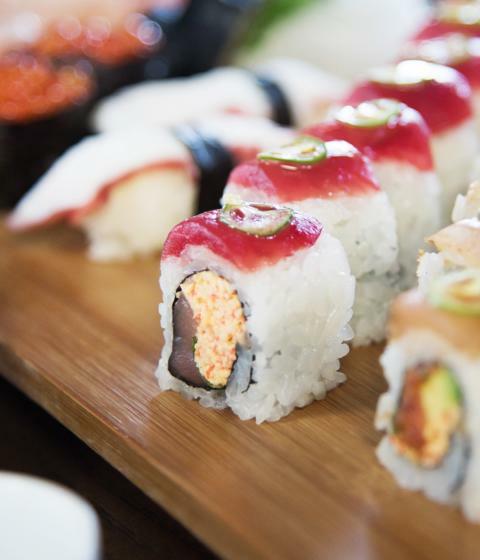 We'll stagger your plates so you can savor it all bite-by-bite, and maximize the sushi experience you've been craving all week. 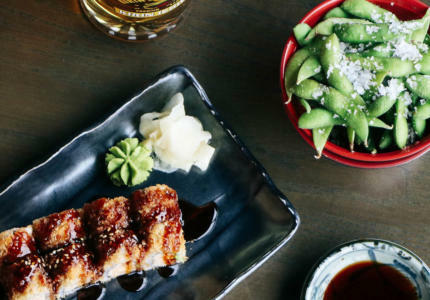 If you're not sure where to start, tour the menu during Happy Hour, where all our guest favorites — from our sushi, grill and drink menus — are available at an amazing value. 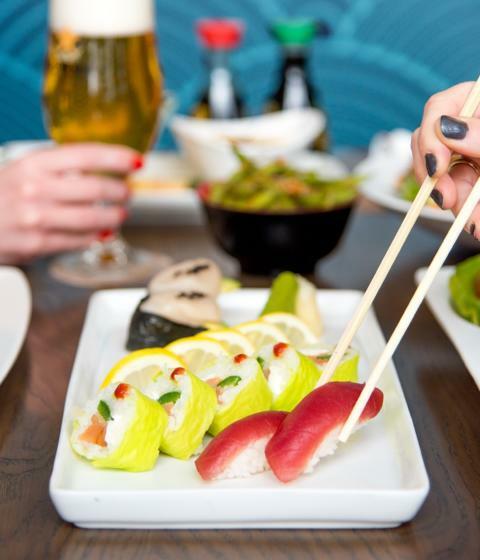 We offer Happy Hour every day of the week at Blue Sushi Sake Grill! 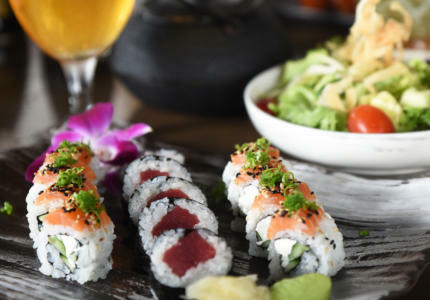 Sushi experts and newcomers: Blue Sushi Sake Grill is your sushi destination to enjoy old favorites or embark on a dining adventure. Our menu offers a diverse range of traditional and creative maki, sashimi and nigiri. Oh, and we're kinda famous for our vegan maki. Order items from our grill menu to alternative between bites of sushi — you'll discover a creative take on Asian-inspired starters, soups, salads and entrées. Our drink menu joins the sushi shindig with an impressive list of premium cold sake, signature cocktails and martinis, beer and hot teas.  Round up your friends, family and coworkers! 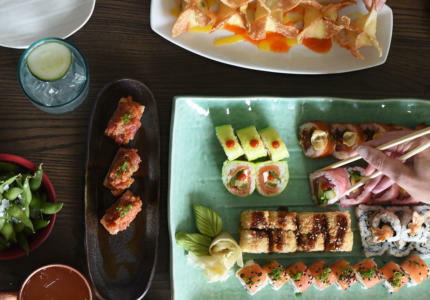 Ordering to share is the best way to experience the creative menu at Blue Sushi Sake Grill.